I was curious to try this ramen for 2 reasons. Reason 1: This email came from Julia, a coworker who is your average picky eater. Her idea of chinese food is chicken lo mein, fried rice, and General Tso’s. Reason 2: The chef, Keizo Shimamoto, has recently been in the news for his buzzworthy Ramen Burger which had a very long line during its Smorgasburg debut. 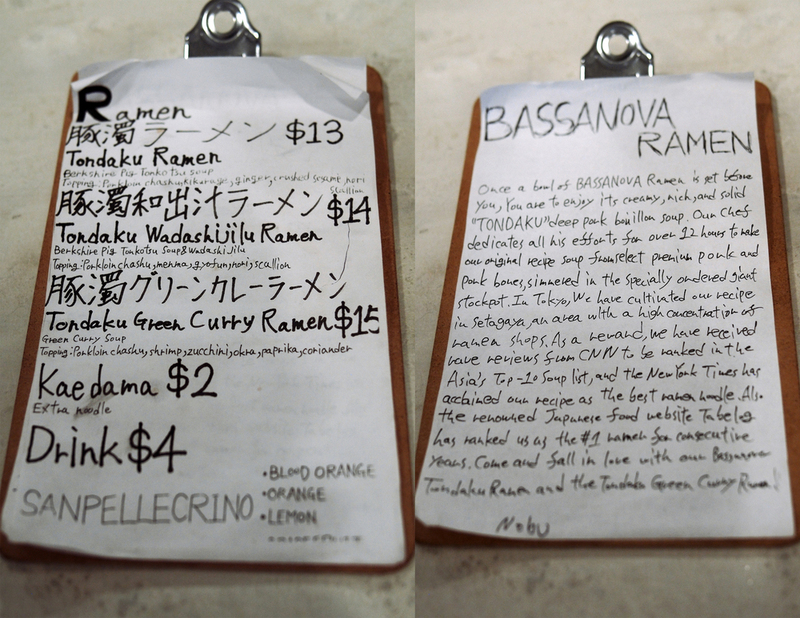 After apprenticing with ramen masters, including Ivan Orkin, Keizo opened the original Bassanova in Tokyo to acclaim. Update: Keizo has recently parted ways and is no longer affiliated with Bassanova. 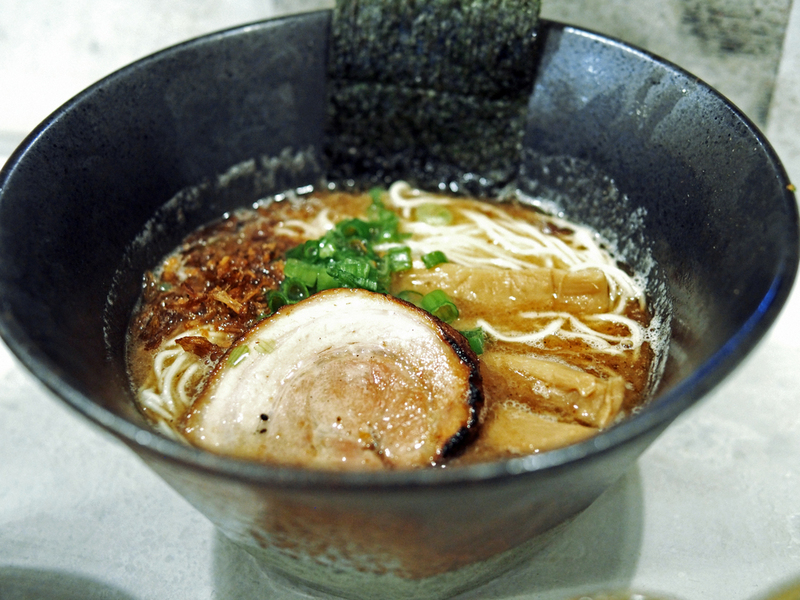 In my book, Ippudo’s Akamaru Ramen has defeated newcomers consistently with its snappy al dente noodles and umamiful broth. Perched alone at the top, it was the one to beat. With that said, I’m always open to trying the competition to see what worked and what didn't work. Julia and I arrived before the dining rush. There were only a few patrons happily slurping away as we made our way to the bar seats in the back. We passed by a beautiful wooden communal table situated in the middle of the restaurant. The white walls were pure, unadorned by posters, paintings, or anything else to detract you from the real masterpieces set before you. I immediately noticed the massive bowls, extra long chopsticks, and the heft of the soup spoon. The restaurant obviously put thought into serving their ramen with quality utensils that weren't from a cheap Chinatown shop. Currently, they only serve San Pellegrino soda as they are awaiting a liquor license. As for the rood, there aren’t any pork buns, shishito peppers, or chicken wings. For now, the focus is on 3 types of ramen offerings: a traditional pork base, a pork and fish base, and a green curry base. Unable to pick just one, we ordered all 3. Julia selected the traditional tonkotsu and I ordered the fish and the curry for myself. He communicated well with his sous chef who was in charge of grilling the chashu on the stovetop, ladling the soup to the bowls, and helping with the plating. 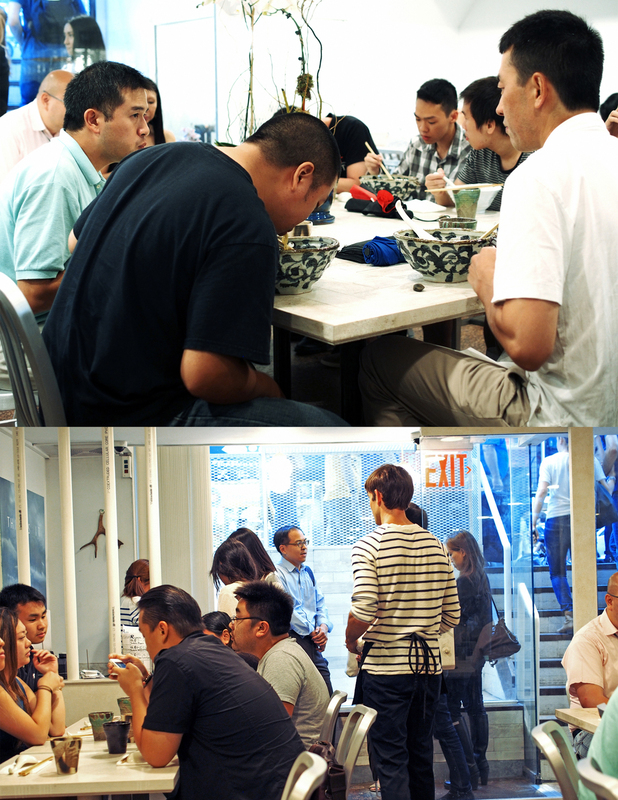 As a result, nothing was backed up and the tiny kitchen was able to serve bowl after bowl in an efficient manner. The operation was streamlined even further by the use of 3 different types of bowls which made it easy for the servers to expedite. Broth - Wow. The broth was rich, balanced and not as salty as Ippudo. If Ippudo was a 9 on a scale for potency and flavor, Bassa’s tonkotsu would be a 7. They should package this broth and sell it as a drink. According to their menu, they honed their recipe in Setagaya, a region known for a high concentration of ramen shops. It takes over 12 hours to make the original recipe soup from select premium pork and pork bones, simmered in a specially ordered giant stockpot. Toppings - For me, the chashu was not very good. It was very lean and a little too chewy. If we’re talking about the best, Momofuku’s pork belly is the one to beat with its sexquisite marbled fat and quality of meat. Ippudo’s chashu is just ok. For me, it’s way too salty with that sauce they douse it with. Plus the meat is dry and too firm for me. Overall - The Tondaku was very comparable to Ippudo for me. Similar noodles, similar portion size, and similar tasting broth. In a nutshell, it was basically a less potent Akamaru Modern with inferior chashu. Broth - From what I understand, it’s a combination of pork and fish stock. The fish flavor is more subtle and much lighter in flavor than the Tondaku. Overall - My least favorite out of the three...I prefer bigger, bolder flavors. Noodles - The noodles were different in shape, curly instead of straight. Texture-wise, it still had the same bite. Broth - Speaking of flavor, this one was both savory and spicy from the coriander and paprika. The curry had a medium heat level that made you want to slurp the noodles even faster. Nothing was too overpowering, just a well-constructed broth. Overall - Absolutely delicious. Since I’m a curry lover, this one takes it for me and has knocked Ippudo’s Akamaru Modern off the throne as my new favorite ramen. Towards, the end of our meal, diners began streaming in and a little queue formed outside. Now is the time to try this place out before the lines get ridiculous. For a nearby cool-me-down dessert, I recommend walking to Chinatown Ice Cream Factory. We got the following flavors: black sesame, almond cookie, lychee sorbet, and dan ta (egg custard). Thanks again to Julia for introducing me to my new weekly ramen fix!